As a sales development rep (SDR) for Lucidchart, I’ve had the opportunity to speak with customers from all levels of an organization to hear firsthand the many different ways they use our solution. Often these customers have applied Lucidchart beyond the typical diagram, process flow, or IT use case—they think of creative ways to tailor it to work for them and their businesses. For example, I spoke to an HR professional who created an org chart and had conditionally formatted the employee shapes to change colors based on tenure of the employee. She also included web links to their company’s employee profile page in each shape of the respective employee. I thought this was awesome. It was creative, and it allowed her to create the org chart the way she had envisioned it. Lucidchart is no longer just a diagramming solution—it is a powerful visual productivity solution that has the ability to promote clarity and increased efficiency at all levels of an organization. These unique use cases inspired me to use Lucidchart as a part of my daily workflow as an SDR. During a team meeting, our manager spoke to us about owning our role as if we were the CEOs of our own business. This meant understanding our KPIs at a granular level and understanding our KPI ratios. During this meeting, we were tasked to know the ratio of dials to connected calls, connected calls to scheduled events, and scheduled events to sales qualified opportunities. 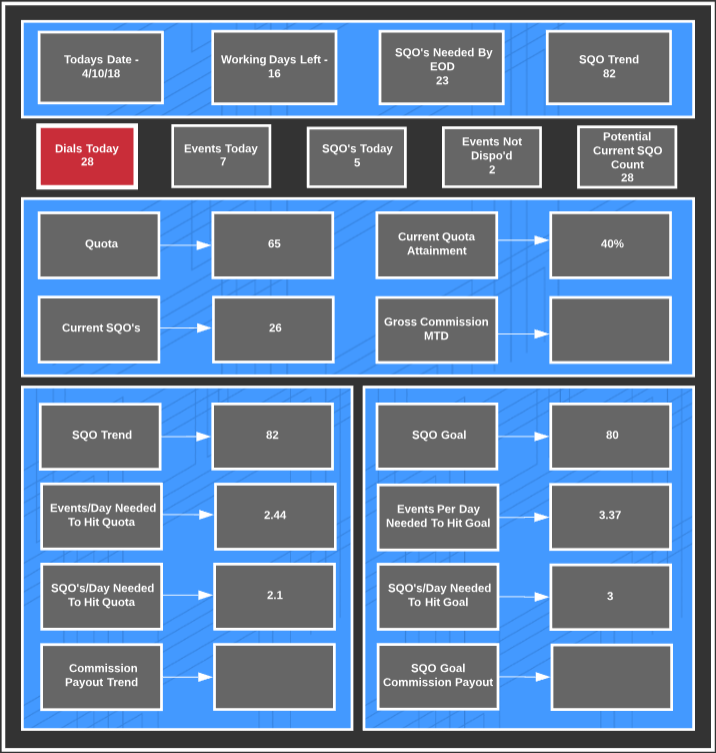 These ratios enable SDRs to know exactly what tasks they should perform based on historical performance to ensure they take action to hit their goals. Instead of checking reports daily in Salesforce and manually calculating numbers, I wanted an easier way to see this information in a central location, add different areas to track, and automate the process as much as possible. Lucidchart could help me do all of this and more through data linking. I realized that I could push Salesforce reports into Google Sheets and link that information directly into Lucidchart. After a few simple clicks, this information was linked to my Lucidchart document, and I was able to represent the data in a visual way. The KPI ratios are automated on the back end and tied into the numbers reflected in my Lucidchart document and certain shapes have direct web links back to Salesforce for me to view those reports. Want to see what data linking can do for your role? Get started with this free template! This process was entirely automated, and with the addition of conditional formatting, I have visual cues to indicate if I’m not on track to hit my daily or monthly goals. Those shapes have been conditionally formatted to remain red if I’m not trending to hit quota or if I have not hit my daily metrics needed to quota. You can see above that the “Dials Today” section is red. Salesforce data shows that, based on my historical conversion ratios, I have to hit 31 dials per day on average to hit quota, and I’m only at 28. The other metrics have already changed colors because the criteria have been met. Lucidchart has done much more than provide guidance in my work—it has been a beacon of motivation. I was able to set goals, see my trends, quota attainment, and all relevant KPIs visually. Everything is in a central location no bigger than my laptop screen that I keep open every day. When I can see that I am going to surpass goals, I set my sights on another level, and with the help of Lucidchart, I was able to nearly double my numbers from Q4 of 2017 to Q1 of 2018. Though I used Lucidchart in my personal workflow as an SDR, this same concept can be manipulated to track opportunities, account growth, pipeline, and much more. Lucidchart makes it easy to convey the information in reports that can get buried and sometimes messy. I will continue to use Lucidchart as I progress in my sales career because it has been proven to be more than just a diagramming solution and I know it will continue to add value to my work no matter what I’m doing. Want to see other ways that you can use Lucidchart to accelerate the sales cycle and close bigger deals, no matter your role? Learn more about our Lucidchart Sales Solution, which includes an integration with Salesforce. 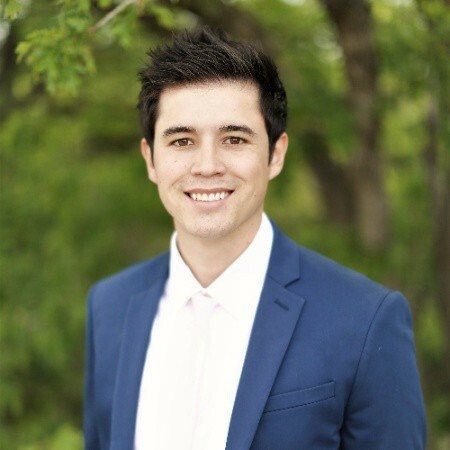 Marco Trujillo is a Sales Development Representative at Lucidchart who is passionate about sales. He has a committed interest in adding value to others by finding solutions to problems. When he is away from work, you can find him with his wife, hanging out with family, traveling, hiking, camping, or out playing sports.